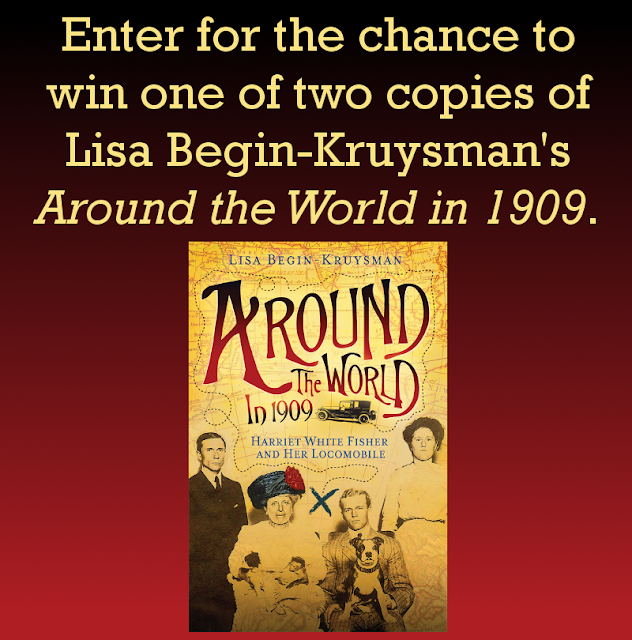 "Around the World in 1909 - Harriet White Fisher and Her Locomobile" June Book Giveaway ~ The History Girl! Would you Travel the World in 1909? Thanks to author Lisa Begin-Kruysman and American History Press, The History Girl is offering two copies of her book Around the World in 1909 – Harriet White Fisher and Her Locomobile. In order to be in the running, submit your name and e-mail address below! In the summer of 1909, an emotionally and physically exhausted industrialist from Trenton, New Jersey named Harriet White Fisher sought tonic by touring the world in a motorcar. She purchased a state-of-the art Locomobile and embarked on a remarkable journey with her driver, maid, butler and dog, exploring places where no man, woman or domesticated house pet had ever ventured. Whether camping in the wild or relaxing at the posh palaces of royal families, this brave band of unlikely travelers met new challenges on each day of their trip. Called the Anvil Queen, Iron Woman, Princess from the Land of Promise, A Lady of Great Consequence, and the Female Napoleon wherever she went, Harriet and her loyal entourage captured the curiosity and imagination of a fascinated public, attracting legions of fans and friends and opening the minds, hearts and highways on four continents. *One entry per person. *Valid for all residents of the 50 United States of America, 13 years of age or older. *Entries without a valid e-mail address are not eligible. *Contest begins June 14, 2015 at 6:00 pm EST and ends June 20, 2015 at 8:00 pm EST. *The winner will be chosen at random. *The winner will be notified via e-mail on June 20, 2015 after 8:00 pm. The winner must respond with a mailing address within thirty-six (36) hours or another winner will be chosen.